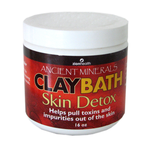 The Clay Bath Skin Detox helps pull toxins and impurities out of the skin. A powerful detoxification bthing clay with the strongest pulling power (ionic charge) for removing toxins through the skin; i.e. chemicals, heavy metals, toxins, impurities and more. Add 1 to 4 oz. under warm running water. Stir the water to keep the minerals from sticking together. Relax in the tub for 20 to 25 minutes.